Is Hillary Ready for a Progressive ‘Realignment’? As she accepts the Democratic presidential nomination, Clinton confronts a once-in-a-generation moment. This article is adapted from Bright, Infinite Future: A General Memoir on the Progressive Rise. Despite gyrating polls after Comey’s denunciation and the RNC “Gotham City” Convention, we’ve quickly arrived at a point that usually comes by Labor Day: Opinion is hardening and variables declining. So we already know enough about both of these 100 percent-recognition nominees to engage in two Nate Silver–like probabilities: Can Hillary Clinton win by 8–10 points, meaning a possible “wave” election, and then would she aggressively pursue a progressive mandate and agenda? That is, despite “caution [being] her defining trait,” according to Chris Cillizza, can the inner Hillary rise to an historic occasion and be more Wellesley boomer than Wall Streeter? In a period of very polarized politics, Trump and Clinton are now unusually unpopular. But the tides of history are carrying her and her party forward. They include: a growing progressive majority, from the 1960s to 2016, on such big issues as climate, choice, women’s and LGBT equality, tax fairness, a pathway to citizenship, drug reform, and gun violence. Indeed, the culture war essentially ended with recent Supreme Court decisions on abortion, affirmative action, and marriage equality (even if no one told Mike Pence). Also, there is the rise of very liberal millennials (who broke 3-1 for Obama) and a drastic shift among white women to the first female major-party nominee. Demography. Clinton will be the beneficiary of the much-commented-on demographic shift in the country, a steady 1-2 points more Latino and liberal every cycle since 1980. Then 90 percent of voters were white, while in 2016 that will fall to 70 percent (and 50 percent in 2045). People have noticed. GOP presidential nominees have lost the popular vote in five of six presidential elections (having won the previous five of six). The party’s net unfavorable nationally is minus 30 (Democrats are even). Gallup reports a 41 percent rise over 25 years in Americans self-identifying as liberal. The gap between registered/leaning Democrats over their GOP counterparts is now 48 to 39 percent. Ironically, the migration of millions of white Southerners from the D to R columns from the ’60s to ’90s at first buoyed the party’s electoral prospects but is now an anchor around the GOP’s neck. It’s admittedly hard to know what to do with a party comprised largely of anti-science fundamentalists and racially tense Southerners in an increasingly diverse country and century. Probably you wait… until they either die off or split off post-2016 into two parties—a “reformicon” one and a white nationalist/nativist one. Trump. Then came Trump, a stress test for democracy and a character test for America. But how does he go from 13 million votes in the primaries to 65 million votes in a general election when Clinton—beyond the historical advantages above—will have more money, more analytics, a far stronger field operation, a more united party (see Sanders embrace vs. Cruz middle finger), make fewer or no gaffes, and likely win debates due to her superior poise and knowledge? When he seems to think that the rants and rallies of the spring will work as well in the fall? Not all variables, of course, trend Democratic. Organized labor can’t deliver as before. An impulse against “third terms” will knock off a few percentage points. So will Hillary’s unforced errors on e-mails and speaking fees as well as very underwater ratings on trustworthiness. White men without college degrees dislike her intensely (although polling indicates that it’s not more than the African-American nominee in 2008). She has to hope that in our super-partisan era, 50 percent negative is the new 40 percent and unindicted beats unqualified. A party with a fringe on the bottom and a “sociopath” on the top (the word is Tony Schwartz’s, author of The Art of the Deal) is struggling in polls. One revealing survey reported that 55 percent of voters said they’d never vote Trump while “only” 43 percent said Clinton. If we start with Obama’s 5 million margin in 2012—and add to it likely 5 million more white women (she’s running 20 points ahead among them over Obama) plus over a million more Hispanics, that would result in a 10 million vote majority, double Obama’s. Conclusion: It’s now even money that the GOP suicide results in a Democratic landslide. Then Clinton would not only capture the White House but also carry the Senate and obviously the Supreme Court once Scalia’s seat is filled, creating the first liberal Court majority in a half century. Winning POTUS, SCOTUS, and the Senate would also mean that the House GOP majority sinks significantly and that HRC would be favored to be reelected, as 42, 43, and 44 were. The model is Reagan, who won by 10 points in 1980 and governed with a congressional and Court majority based on unapologetic conservatism wedded to a Heritage Foundation transition agenda. Starting this week at her convention and then culminating on January 20, history may put her in the enviable situation of either governing based on an unapologetic, popular progressive mandate following a rolling-realignment from ’92 to ’16… or playing small ball. The Bernie Sanders candidacy showed that a populist economic program is not only economically smart but also politically compelling. Hence a clearly liberal platform and nominee this year. Many cynics, however, guess that Clinton’s current posture is mere posturing. But based on Norman Cousins’s view that “no one is smart enough to be a pessimist,” let’s instead assume that this ambitious wonk wants to be more than just the first woman president. As Reagan and Bush 43 showed with their tax cuts, the best way to bend Congress toward your will is to run on a specific program and then credibly insist that “the people of America elected me to do this.” And then repeat that in various iterations every day for 2,920 days over eight years. Footnote: This policy program, though obviously not exhaustive, is based on Clinton’s speeches, the DNC platform, and the author’s own work in “citizen transition” volumes in 1992 and 2008—Changing America and Change for America (the latter with the Center for American Progress)—done at the urging, respectively, first of Governor Clinton and later of Senator Clinton. Given the steady decline in trust in government since Watergate and Vietnam, it’s too much to ask of a presidential candidate to sound like Ralph Nader on the virtues of government programs. But unless Democratic presidents use their bully pulpit to retake the offensive in the “war on government”—as Reagan did in launching it—millions of white blue-collar voters will continue to reflexively blame minorities, elites, and the “party of government” for their economic doldrums. Clinton 45 needs to shift the axis of public debate from abstract rhetoric against “over-regulation” and “big government” to the specific human benefits of democratically enacted rules. Social Security has halved elderly poverty since the ’60s; anti-tobacco policies saved over 8 million lives, and auto-safety laws avoided another 3.5 million deaths; rivers no longer catch fire since the creation of the EPA, and crib deaths are plummeting due to the CPSC. Are there really many Republican parents who would play Russian roulette with their babies in cribs or children in cars? The framework would be the philosophy of our 16th president, not our 40th. Lincoln wisely said that “the legitimate object of government is to do for a community of people [what they] cannot do in their individual capacities,” while Reagan unpatriotically proclaimed that “Government is…the problem.” The new president should embrace the ethic that you cannot love your country in a self-governing democracy and hate its government. Saving Democracy: Less Money/More Voters. When a plane crashes or a sniper kills five police officers, the problem is apparent and urgent. But how do you know when a democracy is dying? It’s when 33 states with Republican majorities make it harder for millions to vote because 0.0000001 percent of all voters may have engaged in voter impersonation, which is already a crime. It’s when 0.1 percent who contribute most of the political money have a larger say than the other 99.9 percent. It’s when the recent conservative majority on the Supreme Court combines two metaphors—money is speech and corporations are people—to create law and pretend that rich people don’t have enough political power. But since the Republican Party is having a hard time winning popular support based on its reactionary stance on issues, it’s now trying to either steal or buy elections—steal by voter suppression laws or buy by drowning opponents in an ocean of money. Or rig by gerrymandering, where politicians choose their voters more than voters their politicians. President Bill Clinton was eloquent about this problem at his 1993 Inaugural Address, when he said, “To renew America, we must revitalize our democracy…. Let us reform our politics so that power and privilege no longer shout down the voice of the people.” But at a key meeting later that year, congressional Democratic leaders persuaded a reluctant president to pull back his campaign finance initiative to supposedly help smooth the way for his economic program. And then it was gone for the following seven years of his presidency. All of these changes, however, confront a brutal political reality: Republican leaders regard more voters and less money as a threat to their existence and will come up with any euphemism possible to stop it. Overcoming that opposition requires a new Congress with many new Democrats but also an administration working with citizen groups like Move to Amend, Public Citizen, and MoveOn to mobilize citizens to tell their elected representatives that elections can’t be auctions. Clinton has proposed a constitutional amendment to overturn Citizens United, not so much for passage in the short term but to deepen a public debate and organizing effort for when the Supreme Court acts. And it requires a “democracy czar” on the White House staff to keep her focused when, as happened to her husband, tactics and crises interrupt. With pocketbook and racial concerns now at the top of voters’ minds, might it again be considered smart politics for a new president to defer proposing a democracy agenda? Not unless she doesn’t care about all her other initiatives. For no president can clean up the environment, reduce economic inequality, and combat gun violence if special interests can short-circuit popular will. Shrinking Inequality and the Wage Gap. By the historical benchmark of the “Misery Index”—inflation and unemployment—Obama’s 6 percent compares very favorably with Carter’s 20 percent in 1980. And his 76 straight months of GDP growth is far better than the economic near-meltdown under the last Republican president. Bush 43 produced minus 435,000 net new jobs; Obama, 13 million (post-recession); Bill Clinton, 22 million. But: The big but is that average real wages have been flat since 1973 (except for the last two years of Clinton 42’s second term). A Clinton 45 has to make the two-part case that she has an economic program for all. First, as educator-in-chief, she’d have to repeatedly expose how free-market fundamentalism has failed both as a matter of policy—from the Great Depression to the Great Recession—and as a matter of theory. That is, “laissez-faire was planned,” in the cheeky phrase of legendary economist Karl Polanyi. More recently, “Inequality is a policy choice” is the thesis of Piketty, Reich, Stiglitz, and Krugman. They argue that the old paradigm of merely giving more money to the rich helps the middle class, that higher deficits invariably mean higher interest rates, and that spending on transfer payments depresses economic growth, is “intellectual malfeasance,” in Krugman’s phrase. Second, there is an alternative approach that would put more money in the pockets of struggling families who would spend it and convince companies to add jobs to meet the new demand. This “middle-out” approach enabled the Obama stimulus to start the streak of new jobs monthly. These policies include: a massive “Jobs4Roads” program (not the word “infrastructure,” please) to generate millions of non-exportable jobs (at a time of very low borrowing costs). A $15 “living wage.” Debt-free public colleges for all but the wealthiest students. Childcare credits to help young working families. A tax credit if firms that participate in employee stock ownership plans raise wages and benefits over a benchmark. Elimination of the “carried interest” hedge fund loophole. And a financial transactions tax—at, say, a barely noticed one-tenth of 1 percent of all stock trades—that would generate nearly $1 trillion over a decade to pay for the growth programs above. The best if not the only way to pull “angry white men” away from the GOP is to explain how Republicans have produced tax cuts for their rich donors but only rhetoric for them while Democrats have delivered more real income and jobs. Then the political jig will be up as it was racially for Southern Democrats after the Civil Rights Acts. That won’t be a “rolling realignment” but a Realignment. Here’s the best evidence that the Democratic demand-side approach works: Since 1960, with Democrats and Republicans splitting control of the executive branch, GDP under Democrats has been 40 percent higher. This is an argument Hillary Clinton can’t ignore or lose. Racial Justice: The “Fire This Time” Is Being Videotaped. Dog-whistle racists like Bill O’Reilly and Rudy Giuliani are furious at an inter-racial president for even discussing racial tensions at the Dallas officers’ funeral. Their contention is that there is no white privilege or racial discrimination, which is true if you don’t count police stops, sentencing disparities, jury selection, voting, employment, income, wealth, mortgages, access to health care, and life expectancy. It’s time for whites to put their skin in the game. That’s begun to happen based on Michelle Alexander’s pioneering work The New Jim Crow, on the calamitous failure of Nixon’s “war on drugs,” on Republicans’ concern over ballooning budgets for the prison system, and on videos documenting abuse for all to see. 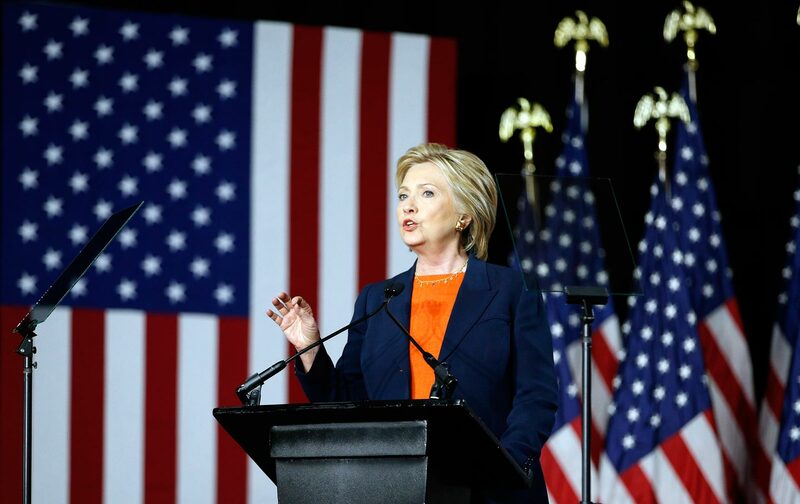 In her very first campaign speech at Columbia University in mid-2015, Clinton herself laid out broadly popular criminal justice reforms involving de-incarceration, second chances, drug treatment, and reduced penalties for low-level, first-time offenses. As president, she could capitalize on the very racial crisis of 2016 to re-create a nonpartisan Kerner Commission to study and combat today’s institutional racism. Last, of course, is guns, with minorities being disproportionate victims. If we can cut 50,000 annual car deaths by two-thirds since 1965 with smart laws and technology, it should be possible—eventually—for democracy to yield to 80 percent majorities when it comes to universal background checks, terror watch lists, assault weapons, and “safe” guns. Climate… Because There’s No Planet B. Senate Majority Leader Mitch McConnell, from coal giant Kentucky, blithely disregards climate change and its dangers: “For everyone who thinks it’s warming, I can find somebody who thinks it isn’t.” No, he can’t—not to mention how odd it is that the GOP worries about the federal debt we’re passing on to our grandchildren but not the poisoned planet that they’re inheriting. The GOP catechism on climate is slowly losing its grip, especially among the politically pivotal millennials. At some point, even obedient Republicans who prize fossil-fuel money will vote with communities suffering devastating fires and hurricanes and with coastal cities with ocean water filling their streets. Senator and Secretary Clinton has been as strong on climate change as any Democrat. Should there be a Democratic Senate in 2017, there’s a climate agenda ready to move: continued strong CAFE standards and support for the EPA’s Carbon Reduction Plan (now in the Supreme Court); ending tax breaks for oil and gas producers; continued support for the Paris climate accord, as India and China start to do their promised share; establishing the goal of installing a half-billion solar panels by 2020 as part of a plan to generate enough from carbon-free renewable-energy sources to power every home in America. Also, at some point, a carbon fee—omitted so far from her speeches and the DNC platform—could be proposed to raise hundreds of billions to be either rebated back to homeowners or invested in renewable energy… perhaps also even a second-term small gasoline tax to be dedicated to road and bridge infrastructure improvements if gas prices stay low. It’s 6:45 am at Reince Preibus’s DC home as he bolts awake with a sense of dread and déjà vu. Having been through this exactly four years prior, he knows what’s coming—a GOP blame game when no one will take responsibility for Trump’s big defeat even though, like Murder on the Orient Express, all had a hand in that political crime. The GOP may then divide into the few who clamor for new approaches to retake the presidential majority, while most will simply retreat to their profitable consulting firms, law firms, and cable studios and continue to chase Kasich-like heretics out of the Church of Conservatism. Nearly all will dismiss Trump as a bizarre “one-off” whose name presumably will not be mentioned at the 2020 convention. At the White House that morning, however, Clinton 45 and her top advisers are celebrating her well-received Inaugural Address! Now they are polishing up her morning remarks to capitalize on her big victory, capture of the Senate majority, and reduction of Ryan’s House majority by two-thirds.